First, a little bit about me. I've lived on the Sunshine Coast off and on for the last 35 years and for much of that time I've hiked or biked almost every day. 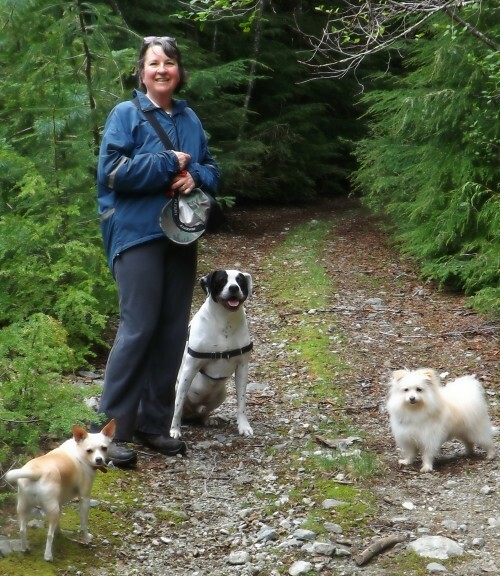 I love the outdoors and there's nothing better than being out in the forest with my dogs. I always tell people hiking and mountain biking are truly "natural" anti-depressants. I always come home feeling better than when I went out and I do some of my best thinking on the trails (sometimes I'm pretty sure that's the only place my brain actually works :-). At times, I hike or bike with friends, but I always have my dogs with me. Nick's the handsome big guy and Honey's the little one who someone I met out on the trail said looks a bit like Phyllis Diller! Hmm, she actually does. Finally, although not pictured, I have a little Chihuahua that we are fostering whose name is Sookie. Anyway, that's enough about me and the dogs. Second is the reason I decided to create this website. One day in the spring of 2010 I had decided that I wanted to try a new trail - something completely new and different. Because I hike or bike so often it gets pretty boring always using the same trails day after day so I went online and searched and searched and only came up with websites that had a sprinkling of the most popular trails. Trails I already knew very well. I searched some more and still had no real success. It was from this point on that I decided that maybe I needed to create a website myself that would provide a comprehensive listing of all the trails on the Sunshine Coast. It took almost a year for the idea to percolate to the point where I felt ready to tackle the job. And what a huge job it is, but what fun too! I get to explore every trail on the Sunshine Coast and I can't think of anything I like better. I now have over 100 pages live on the web. I also have most of the trails gps'd and mapped, but it will never really end as trails are always changing and being built and I will always be tweaking my site. Now that I have the trails under control I may branch out to other areas such as lodging, restaurants and other outdoor activities. 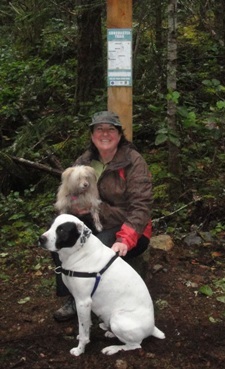 Click here to return from About Me to the Sunshine Coast Trails Home page. Nick, Honey and I take a break while hiking the Homesite area of the Suncoaster Trail.